Looking for a funny dog character for a project? From time to time I will be creating funny characters for you to use at a much cheaper cost than having me draw one from scratch. Some of these images are rejected projects, unpaid projects or concepts. These fun designs can be purchased and used on many different graphic design formats. One of my favorite new characters is this crazy flying dog. 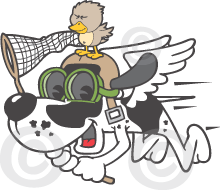 He’s a great looking black spotted bird dog not only flying but wearing a set of wings, a pilots helmet and airplane goggles. He’s got his trusty bird catching net and his prey is riding along on top of his head. This design would be great for a bird pest removal company or a bird dog kennel. There are also many other things this image could be used on. A bird hunt flyer or dog training brochure come to mind. This cartoon image is a royalty free design that can be used for multiple purposes after paying one low flat fee. This cute flying dog can be yours for use with any of your promotional projects. Although you are free to use him as part of your advertising you cannot copyright him. I retain the copyright and other clients have the rights to use him royalty free as well. Because of his royalty free nature we are able to keep the cost of using him at a lower rate. If you would like a funny custom cartoon dog character just let me know the details and I can get you a quote and more information. Upon purchase you will receive a vector EPS, high qulaity PDF, 300 dpi JPEG and a transparent PNG file. You can use the PayPal button below for payment. I use Zazzle.com to get many of my things printed. Use any one of my royalty free characters to help promote your business or service. 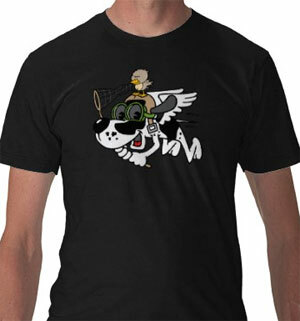 I used the wacky bird dog design on this black t-shirt. If you click on the photo you’ll be taken to the design page. There you can pick your own t-shirt design or any other product. You can then add your own text or add your logo and Zazzle will print the merchandise for you. Open a own store with your own customized products and make money or just use the promotional materials to advertise your company.